Quick thinking by a Good Samaritan helped save a sea turtle on Thanksgiving day. 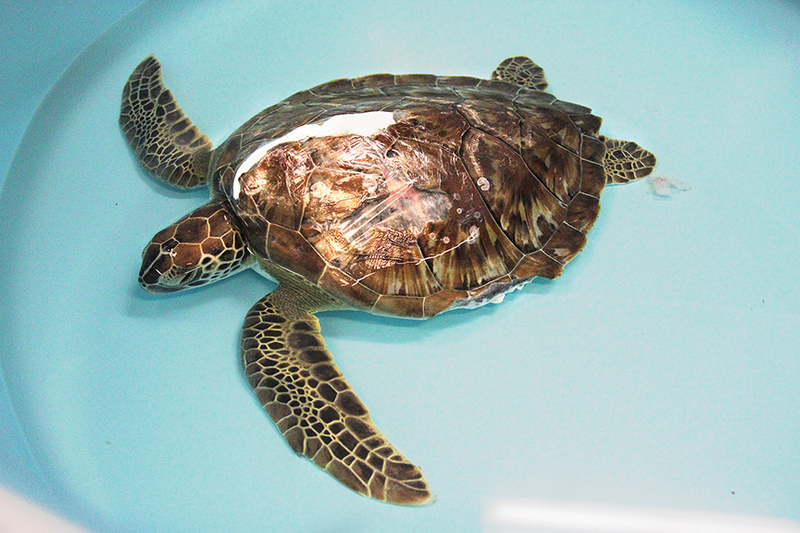 Dubbed “Gobbler,” in honor of the timing of his rescue, the Atlantic green sea turtle was found floating in the ship channel by a member of the public who noticed that something looked amiss. The young turtle’s shell was covered in a brownish coat of grime, and bright green strands of algae trailing from the top of his shell just behind his head. “She just saw him struggling, called us. She was concerned. She gave us a description of what he was doing,” said Sanjuana Zavala, marketing and public relations manager for Sea Turtle Inc. Wednesday. Sea Turtle Inc. (STI) staff soon mobilized to recover the turtle from the water. It wasn’t until they brought him back to their facilities on the north end of the Island that they noticed Gobbler had a severe injury to his shell. “We didn’t really see the boat strike because the vegetation was in it,” Zavala said.